To celebrate AdvantEdge Business Centers' March Madness events, we are dedicating this blog post to the NCAA Championships! Thanks to the news-media, there is indeed a certain “madness” to be found during March. Every year around this time we encounter a flurry of articles and news stories discussing how to build a better bracket for your office pool and possible drops in worker productivity, but there are also many stories about the lesser known aspects and effects of the NCAA Championship Tournament. 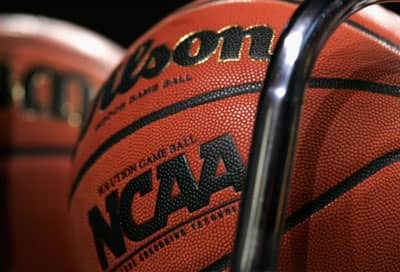 Here are a few examples how March Madness influences the world off the court. March Madness dribbles down to kids: Children are getting involved with the madness both as the target and vehicles of advertisers. From team paraphernalia for kids like bibs and booties, to March Madness kids’ night at your local Chick-fill-a, marketing teams are counting on your kids to push your purchasing power in their direction. AT&T has taken this concept to another level with their new marketing campaignBrackets by Six Year Olds. The website offers you the insights of Los Angeles school children on bracket building while encouraging you to buy the Samsung Galaxy Note smart phone to check-up on your favorite teams on-the-go during the tournament. March Madness and the Economic Geography of Sports: Wondering why Georgetown is the only top seeded tournament team that comes from one of the country’s ten largest metro-areas? The answer may be more aboutconference rooms than basketball courts. A recent study shows that there are more jobs related to sports in small and medium sized communities. This holds true not only for jobs related to college sports, but professional sports as well. Music and Movies March into the Madness: March is also one of the biggest times of year for live music and movies. March Madness themed music festivals are being hosted in cities all over the country this month. From rock bands in New York to Celtic folk groups in Cottonwood Falls, Kansas The Black Keys’ official March Madness theme song is not the only music to look out for during the tournament. March is also reportedas the biggest non-summer, non-holiday month for movies.